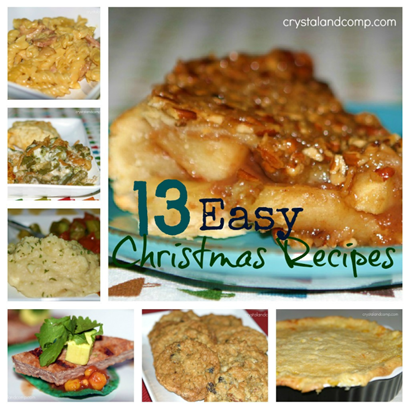 13 Easy Christmas Recipes and How to Use Up Leftovers (Plus 10 Ways to Cook a Ham)! You are here: Home / Holidays / 13 Easy Christmas Recipes and How to Use Up Leftovers (Plus 10 Ways to Cook a Ham)! Are you hosting Christmas at your house this year or do you travel and sign up to bring a dish? At Christmas we generally do Tex-Mex food, but I know many people still do traditional Christmas dinners. If you’re still searching for recipes to make your menu complete, I have an awesome list of appetizers, sides and desserts you can make. All of these are easy recipes that come together effortlessly. Crockpot Spinach Artichoke Dip– any appetizer that can be prepared in the crock-pot is a winner in my book! Grilled Salsa Steak Appetizer– tasty, filling, bite-sized appetizers. Pizza Dip– great dip while everyone is waiting on the turkey and ham. Easy Corn Casserole– if you’ve been asked to bring a side to Christmas dinner, this corn casserole is a crowd pleaser! Crockpot Green Bean Casserole– traveling and need something easy to take to a family dinner? Take this Crystal & Co., favorite that cooks perfectly in the crock-pot. Crockpot Garlic Mashed Potatoes– once you make mashed potatoes in the crock-pot, you will never make them any other way again. Ranger Cookies– perfect to make and leave out for Santa. Apple Pecan Upside Down Pie– this is a delicious twist on a traditional dessert. Crockpot Blueberry Cobbler– No babysitting this recipe while you’re working on other holiday preparation. Score! Crockpot Lava Cake– fancy and simple. Jello Poke Cake- make this a family project and let the kids help! No Bake Blueberry Banana Pie– my mother has made this for years on Thanksgiving and Christmas. I love traditions. Pina Colada Cake– another one of my mother’s recipes that is always a winner. Crockpot Hashbrown Casserole– perfect breakfast recipe that cooks well in the crock-pot and uses up any leftover ham you have on hand. Yum! Black Bean and Corn Quesadillas– leftover shredded turkey or diced ham will make this leftover recipe a winner. Nachos– the leftover turkey shredded goes perfectly on baked nachos. Crockpot Enchilada Casserole– this is another recipe that is easy to sub the chicken for shredded turkey. Is there a family favorite Christmas recipe you make every year? I would love to hear about it! Crystal is mom to five boys, author of the mommy resource site Crystal & Co., and lover of easy recipes. She shares endless ideas and solutions to help busy moms just like you. If meal planning is something you struggle with, check out her eBook How to Meal Plan: A Step by Step Guide for Busy Moms.